As I was walking through a farmers market over the weekend I stumbled upon a used book store selling mystery bags of romance books. How fun! Of course I had to buy a couple. I wonder what adventure or steamy encounter is inside. But that's for you to discover! You can have two chances to win. Comment on this post for one chance to win. And then head over to my Facebook post for another chance. A winner will be picked on Wednesday morning (6/13/18), so hurry. 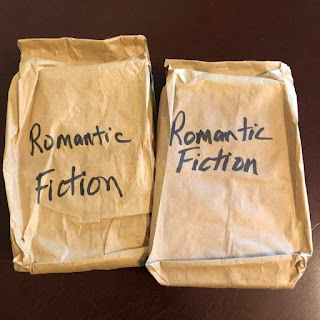 Each bag has two books inside. 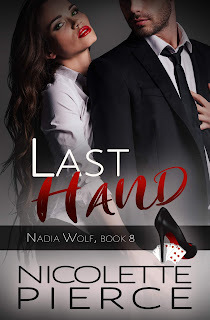 And while you are moseying around the internet, take a look at the preorder for Last Hand, the conclusion of the Nadia Wolf story. It'll be epic. 8.10.18. Nadia Wolf returns to Las Vegas, knowing her bad luck will return as soon as the plane lands. While Caleb is quite talented at keeping her mind off nearly everything, not even he can stop a past threat that continues to plague them. One by one her friends begin to disappear. When Caleb vanishes next, she fights to find him and the others before time runs out and all is lost.